Corky Siegel's Chamber Blues"Complementary Colors"
Master blues harmonica player Corky Siegel (former co-founder of the legendary Chicago Siegel-Schwall Band) fuses traditional blues with a classical string quartet (plus a percussionist), creating a new genre of music that has its own flavor as it switches moods: from smoky to jaunty to rapid-fire to melancholy. This is a bold amalgamation of styles (the follow-up to Siegel's successful 1994 release, Corky Siegel's Chamber Blues) that works because of Siegel's mastery of the Blues and Classical worlds. 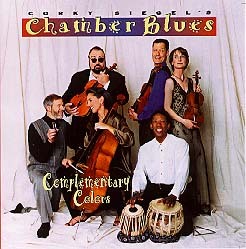 Corky Siegel's Chamber Blues brings to classical music the same creative genius and instrumental virtuosity which Corky brought to traditional Chicago blues during the heyday of the legendary Siegel-Schwall Band, fronted by Corky and guitarist Jim Schwall during the late '60s and early '70s. Even then, Corky had begun juxtaposing the two musical genres, not, as he explains, "by performing Brahms on the blues harmonica or begging a symphony to play Hoochie Coochie Man." Instead, Corky, in effect, concocted a pure hybrid, crossing the blues and the classical to form a new musical strain. If you will, a third stream blues: Chamber Blues. First of all you should know that none of this Chamber Blues thing was my fault. It grabbed me and it won't let go. Since 1988 people (after a concert of Chamber Blues) have been asking me the same question; "How is it that such diverse forms of music seem to blend so naturally?" I have gone through a gamut of answers but after 10 years of riding on the hood ornament of a vehicle crashing 100 miles an hour through the walls of musical traditionalism I have been able to come to some verbal resolution about this. Look at it this way: When we think of the blues, don't we think of some guy wailing on an old beat up guitar in a smoky tavern with a bunch of people in jeans and T-shirts? When we think of classical music don't we flash on an ornate concert hall with a grand piano on high stick and a performer in tux and tails and women in sparkling evening gowns? Just the visual image alone makes it seem like classical music and blues are worlds apart. The music itself is innocent of this visual diversity. The music is made up of chords, melodies, harmonies, counterpoint, dynamics, articulations and rhythm. It doesn't know about smoke-filled rooms, blue jeans, or tuxedoes. It doesn't rely on ushers passing out programs or a society passing out dress codes. The music is blind. All it cares about is having a wonderful time.